In the development of modern electronic modules, there is a global trend for the level of integration to significantly increase. Apart from the components, of course the printed circuits which accommodate them must follow. Apart from the general reduction in the widths of structures (track widths and spacings) and the use of blind vias, integration can be further increased by a sequential build up of multilayer boards and the use of buried vias. The use of buried vias means that holes that go through all layers can be avoided, making more space available on the outer layers to place components. This information serves as a supplement to the "blind vias" technology information sheet and should help to design a technically optimised and cost-optimised circuit. An SBU multilayer board is made up of a 2-layer or multilayer core and one or more external, microvia layers. 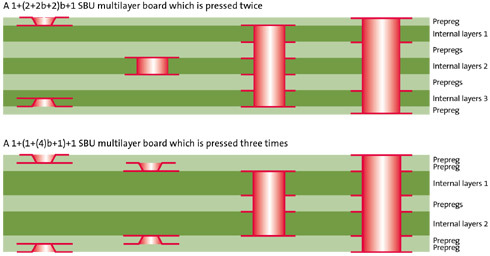 If buried vias occur in more than 2 layers or in several external microvia layers, then at least 2 pressing procedures will be necessary in the production process. The examples shown only represent 2 of the possible options. At CONTAG, blind vias are produced by mechanical drilling. This is why consistently good hole quality can be achieved with armoured prepregs as a dielectric for SBU boards. Depending on the layout and the build up of the multilayer board, the prepreg types 106 (about 50 µm thick) and 1080 (about 65 µm thick) have proved to be excellent for standard use. Apart from being good to process, very reliable and with good availability, it is a cheaper material compared to RCC film. For reliable, high quality manufacturing, the critical steps in the production process are monitored by checking the setup and cutting sections for analysis, as appropriate for the process and job. HDI/SBU technology means finest structures and complex multilayer boards. CONTAG has this technology available and of course can also offer these circuits as a rush service. (Tel. 030/351 788 – 155).